After we arrive from airport coming from Lebanon, We will leave Muscat and drive to Nakhal. 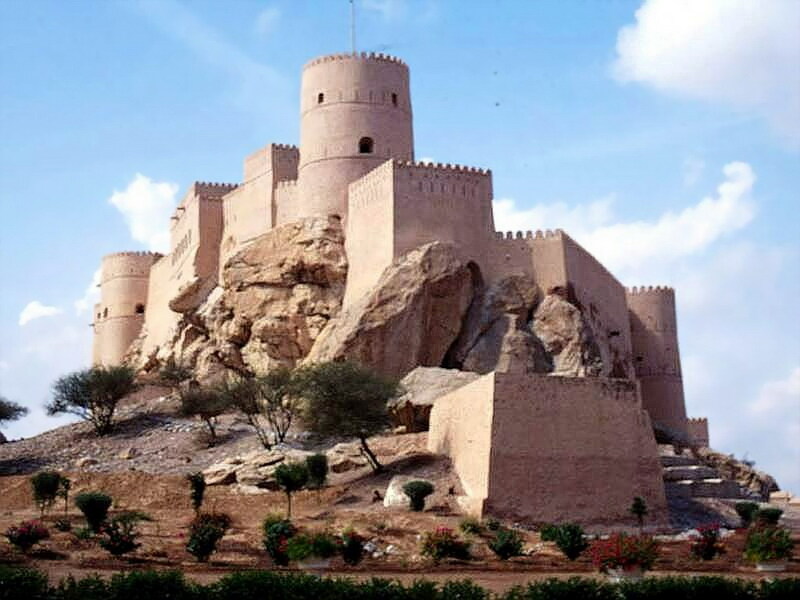 Here you can visit the beautiful Nakhl Fortress. It lies at the foothills of the mountains in a nice small village which grows extensive date palm plantations. This magnificent 350 years old fortress rises out of the mountain rock, towering high above the ancient village, as if still warning would-be attackers of its ominous strength. It has witnessed many battles and is packed full of hidden escape routes and secret passages. You can stroll around the inside of this restored fortress and visit all the rooms which have been nicely decorated in the original old style. The view from the top of the fortress over the mountains and green date plantations is outstanding. From there we drive into the Wadi Bani Awf. The road leads us through the Wadi for about 1 Â½ hours and we will pass by impressive Wadi Canyons and several small villages. We will drive up the Mountain, This mountain road drive up to the Jebel Shams Mountains is one of the most adventurous in Oman, offering exiciting offroad experience and fantastic views. In the evening we will reach Nizwa, where we spend the first Night of the tour. We will visit the famous Nizwa Souq. It is among the largest of its kind in Oman. A wide variety of vendors offer their goods in the streets of the souk from 05:00 am to about 10:00 am each morning. Here you can find fish, meat, vegetables, pottery, jewellery, handicrafts and souvenirs which are sold in authentic old market halls that few places can boast. Especially interesting is the Friday cattle market, when the locals from the nearby Villages come to sell their donkeys, goats, cattle, sheep and chickens in a circus style open market place. In the afternoon we continue to our desert camp in the Wahiba Sands desert, where you first take part in an adventurous 4x4 sanddune drive, followed by watching the stunning sunset of the desert on one of the big sand dunes. We finish the day with a Dinner at the camp and a nice relaxing time around a romantic campfire. After a relaxing slow breakfast in the Desert Camp, we will take you to Wadi Bani Khalid, one of the biggest and most beautiful wadis in Oman. Here you can swim, sunbath, relax and have a picnic in the beautiful scenic wadi canyons. From here we drive to Sur, where we will have a small city tour, before we drive to Ras al Hadd to check in out Hotel/Camp for the night. In the evening we take you to the Turtle sanctuary at Ras Al Jinz. Here we will go on a guided beautiful walking tour on the beach at night under the stars, where we have a high chance of seeing Omans great sea turtles stumbling on to the beach to build a nest and lay the eggs. If you are lucky, you can even see baby turtles hatching from some nests. Today we will take you to Wadi Shab. This Wadi is a enormous canyon gorge that is lined with palm trees and impressive indications of what the power of the water coming down from the mountains can do in nature. With a 45 minute hike up through the canyon Wadi, we arrive at one of several crystal clear water pools. Tourists can swim on through the warm waters from pool to pool. Eventually we come to the last pool where an opening among the enormous rocks allows us to swim into an incredible crevice cave with a small waterfall. Inside, the sunlight filters in from the outside, turning the water into a beautiful turquoise blue whilst water showers down one side of the cave from the Wadi beyond. In the late afternoon we drive back to Muscat.